This was an interesting job. The customer hires out vans for travellers kitted out with a roof top tent. 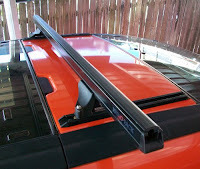 The Estima is a grey import so there are no roof racks readily available in Australia that will go into the roofrack mounting points that are on the vehicle. Even if they were this would not give sufficient strength to support the weight of two people sleeping in the roof top tent. Additionally the vehicle has a big 'moon roof' in the centre of the roof. The solution we came up with was to use 30mm sections of heavy duty Rhino track attached with rivets to spread the load at the strongest points of the roof. 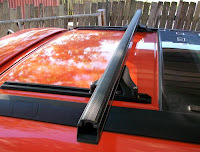 This was then fitted with Rhino heavy duty track mount legs and cross bars.